Disclosure: I was sent sample products for the purposes of review. All thoughts and opinions are my own. Last month I had the opportunity to share some tips for raising a maker on a local TV station. The Maker Movement is catching fire with the younger generation and I’m so excited to see that toy companies are catching the bug too. We have two very creative boys that love exploring, and asking A LOT of questions. These toys provide endless hours of structured and unstructured open ended play for the whole family. 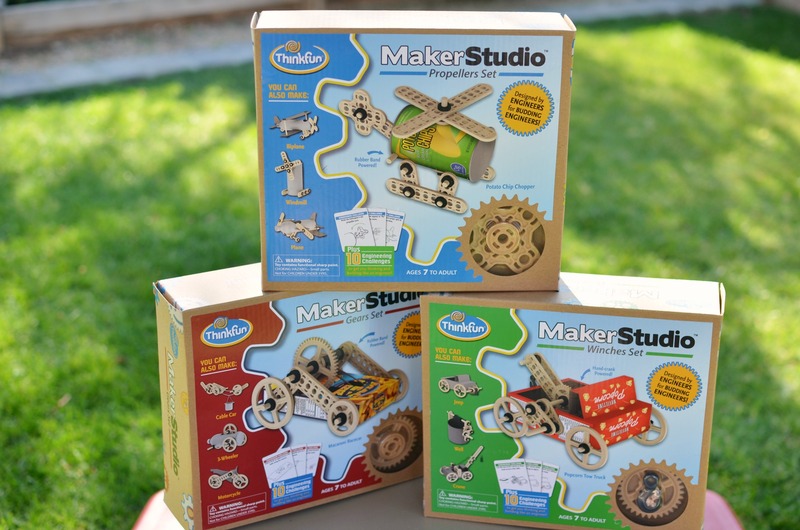 Think Fun just launched their Maker Studio™ Construction Sets this month. 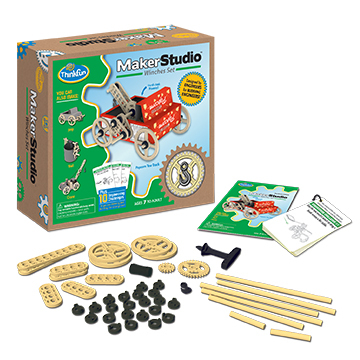 The Maker Studio consists of 3 different construction sets designed by makers/engineers for kids (Ages 7 to adult) who want to “build, do and explore!”; right up our alley. 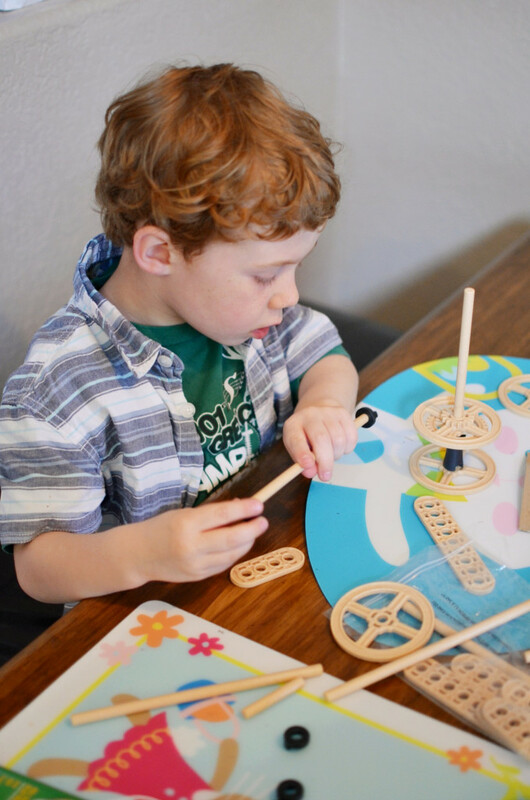 Each set comes with all the materials needed to transform recycled materials into one of a kind kinetic inventions. In addition to the main build are challenges. 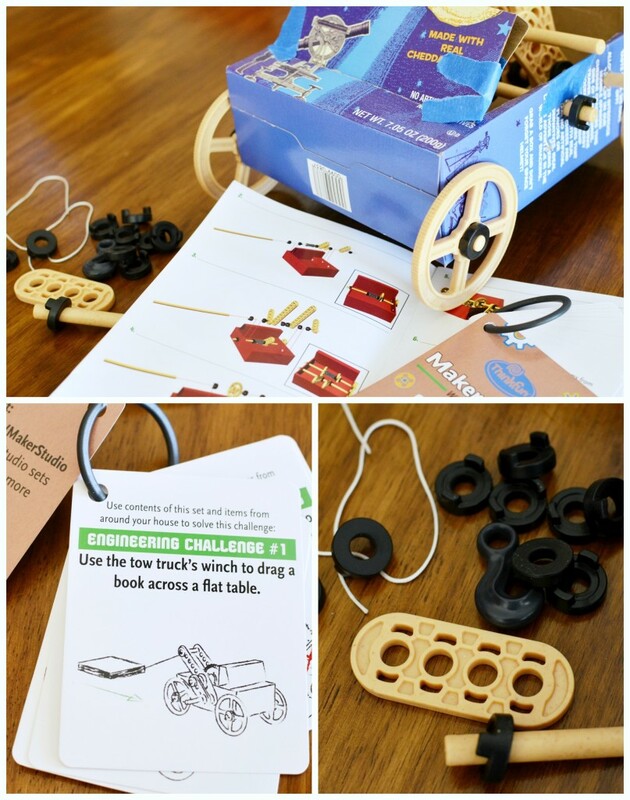 Each card presents a different challenge, encouraging budding engineers to tinker with their build to create and fine tune their invention. My oldest is 5 so we have been utilizing the sets for free build. He isn’t quite old enough to master the challenges and engineering on his own, but building is fun too! Each set consists of plastic wheels, gears, rods, and rubber connectors. They also include a handy punch for boring holes easily into recycled materials. 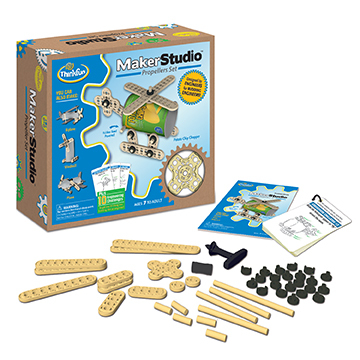 Maker Studio Sets are available online at ThinkFun.com and Amazon. Sets retail for $19.99. I have a chance for one reader to WIN a Maker Studio Set of their choice. 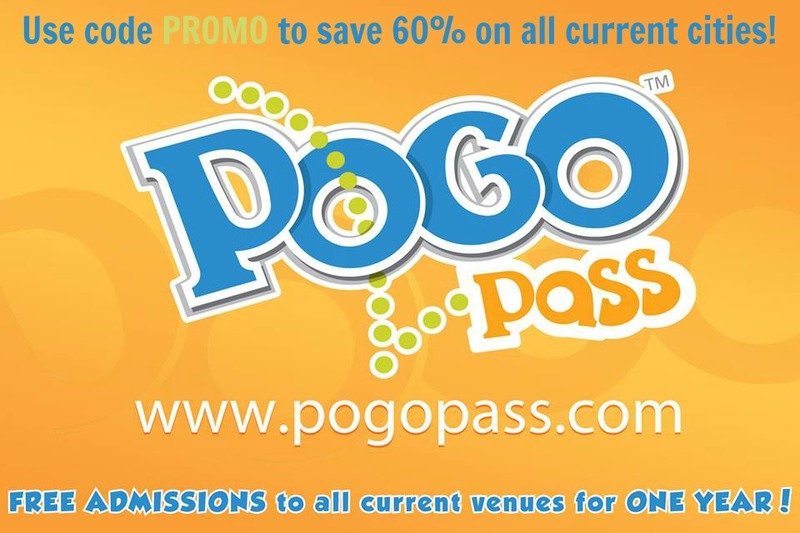 Connect on Facebook and Twitter to stay up to date on new offerings. Think Fun will be open-sourcing all parts and new expansion pieces, making them available as free downloadable 3D printing files. My boys would love any of these but probably the propeller set would be a first choice. I’d like to win the winches set. They all look fun, I’d most love to win the Gears set. propellers! My son loves airplanes! The propeller set looks like a ton of fun. I think my son would enjoy the Gears set. The propellers one looks neat for my sons! My daughter would love the propeller set. I would like the Winches set. My kids would have a blast with the gears set! Great project for the long dog days of summer! Great giveaway! My kids would like the gear set. I would love the Crane SET. my kids would like the Propeller set! I’d like the winches. This would be perfect for a six year old in a family of enigineers. My son would love the gears set. 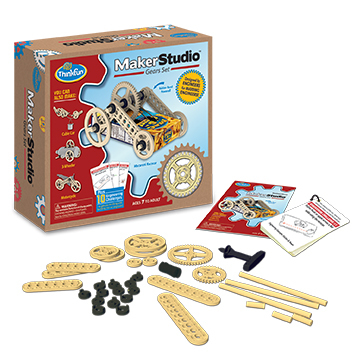 My children would love the Creative Maker Studio Gears set the best! The Winches set would be great for my son! I like the gears set. I think the winch one is good too. They all look great I think my son would love the gears set the most! I would like to win the Propellers Maker Studio Set. I know my sons would have a great time with the Propellers Set and the Windmill would be the first on their list. The propeller or gear one looks fun! If we won, we’d like the Winches Set. I would love the Propeller set for my son! He loves all things that fly and would just flip to be able build his own! The gear set would be great! I would like the propellers one if I won. I would love to win the Gears set. I think my son would really like it. The gears set would be perfect for my boys. I would like the Gear’s kit. I love them all but the crane would be my first choice. Thank you for the great giveaway. I think my kids would enjoy the gears set the most, but they’d definitely have fun with any of them.